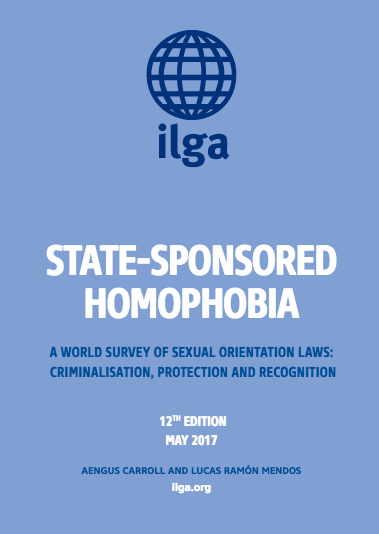 Today, Monday May 15, the International Lesbian, Gay, Bisexual, Trans and Intersex Association (ILGA) launched the 12th edition of its flagship publication, State-Sponsored Homophobia – A World Survey of Sexual Orientation Laws: Criminalisation, Protection and Recognition. Since its first edition in 2006, State-Sponsored Homophobia has offered a comprehensive compilation of useful and credible data on laws affecting people worldwide on the basis of their sexual orientation. This release comes just ahead of the International Day against Homophobia Transphobia and Biphobia to be celebrated on May 17, and it is a fundamental resource in the hands of human rights defenders, researchers, civil society organisations, governmental and UN agencies, allies and media striving for a more just and inclusive society.